I’m one-upping the simple things this holiday season. Making nut milk is a simple process; it’s just tedious and not so great for the time-constrained demands of life for pretty much everyone. I sometimes feel like Christmas actually brings out even more stress for many people. Rushing around to get the latest trending gift, having the house decorated, attending one party to the next, etc., etc.! I think it’s even more important that we try and take a step back and just enjoy the moment. Because before you know it, it’s passing you by and if there’s one time of the year where everyone should take part in that, shouldn’t it be the holiday season? In saying this, I’m just coming down from one of the busiest years I’ve had. Completing a program that is essentially four years of university/college crammed into one year will do that to you. In the last couple of months, I haven’t made time to do much of anything to nourish my body including everything that I talk to people about finding and making the time to do! It happens to the best of us. We all have moments when there’s too much going on. So long as we become aware of this and then begin to take inventory on areas where we could improve on carving out specific time to take care of ourselves- that is the key. And so onto homemade nut milk! I have previously shared my almond milk recipe, but as it’s Christmas, I wanted to make something that to be honest, required minimal effort but was still a little extra. Nut milk is great way of doing this as there are endless options of nuts and seeds to choose from, plus whatever you’d like to add to flavour the milk. It’s also something that you can choose to make solely for yourself as a special treat that can be added to your morning coffee or blended into a smoothie. I always remember as a kid having hazelnuts around Christmas time. I also always adored Ferrero Rocher and was given a box to myself each year. 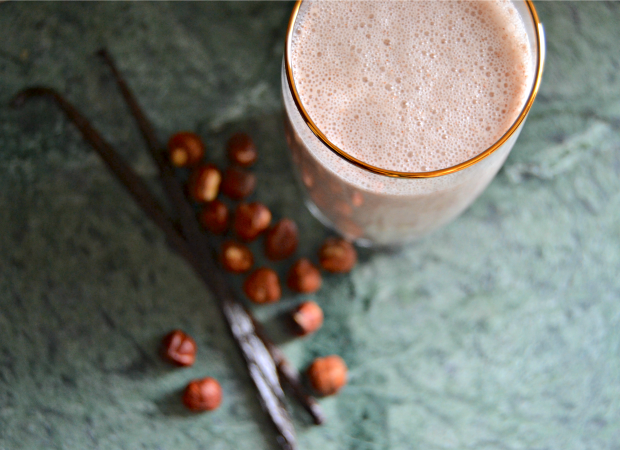 It made sense then, to make a hazelnut milk and add to it seasonal spices. The result of which is this delicious, creamy nut milk. Hazelnuts make a wholesome choice with minerals such as magnesium, manganese, copper, folate, and iron, and vitamins E and B6. They provide plenty of antioxidants including polyphenols (also found in red wine and dark chocolate) to help with signs of aging and reducing the onset of disease. For richer milk, you may choose to add less cups of water than you usually would (2-3 cups vs. 3-4 cups). I find you don’t really need to strain the pulp as you don’t really get that much, which means you’re getting even more benefit from the entirety of the nuts. Since making this, I’ve enjoyed it in my hot cocoa and blended into a smoothie with frozen banana and maca for that Ferrero Rocher taste done in a healthy way. Enjoy this yourself by adding your own spices that you love. It makes a delicious treat with some Christmas cookies! Pinch of spices: cinnamon, cardamom, ginger, nutmeg, etc. Soak the hazelnuts before rinsing well and draining. Add to a high-speed blender with 2 cups of water and blend. Scrape the seeds from the vanilla bean and add to the blender with your choice of spices and sweetener. Blend until completely smooth then add to a sealed jar and refrigerate. This keeps well for 3-4 days. Add to smoothies, hot cocoa, porridge, overnight oats, enjoy on its own! There are a lot of misconceptions when it comes to enjoying eating in a healthier way. Many people claim they don’t have the time to eat well, or it’s difficult to do so when you’re eating out, or that simply, it just doesn’t taste as good. I think the best way of winning people over is showing them that you can actually still eat well with tasty and delicious food and one of the best ways (in my opinion) is with dessert! This fudge came about when I had some leftover chickpeas. They are the magic ingredient in this dessert. I didn’t want to make something savoury with them and I thought if I blended them with some cashews and added in some cacao it could wind up being a simple and quick sweet tooth fix. 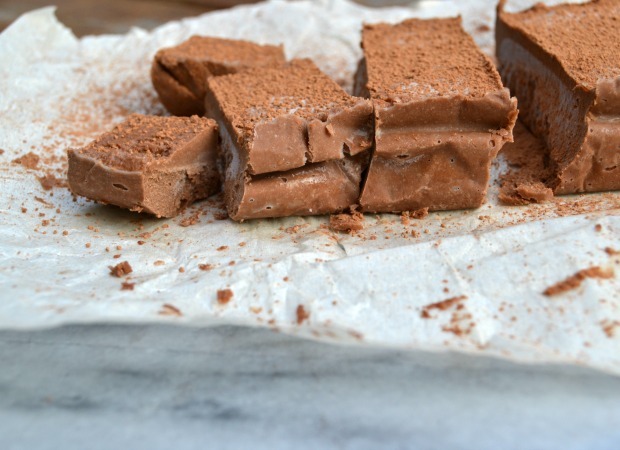 After leaving the fudge to sit in the freezer for a couple hours, you have a healthy decadent dessert, all of which takes you no time to prepare with only six ingredients. This recipe gives you protein, fibre, and healthy fats that help to balance hormones and manage sugar cravings in a healthier way. And they are ingredients that you’ll feel far better in consuming and are kinder to your body than the usual refined and processed sugars that make up the conventional fudge. You can change this up to suit what you like by adding some raw cacao nibs, chopped dark chocolate, or chopped nuts. Just mix it in at the end before you pop it in the freezer. This will not only take away a chocolate craving, it will fill you up before you get the chance to finish the whole pan! Blend chickpeas and cashews in a food processor until combined. Add the rest of the ingredients, except for the raw cacao, and blend until smooth. Add the raw cacao and blend again until the whole mix comes together. Add to a parchment lined baking tray and pop in the freezer until firm, usually a couple of hours. Remove from the freezer, pop out of the tray, cut into squares and enjoy! Last year, I shared a basic pancake recipe, one that could easily be added to or used as a base for some delicious toppings. This year, the base IS the best part. I’ve been playing with some recipes to try to create a great tasting fluffy pancake that could also be made vegan for an all-inclusive recipe that anyone can enjoy. I challenge you to see if your friends and family notice it’s gluten free and dairy free too! 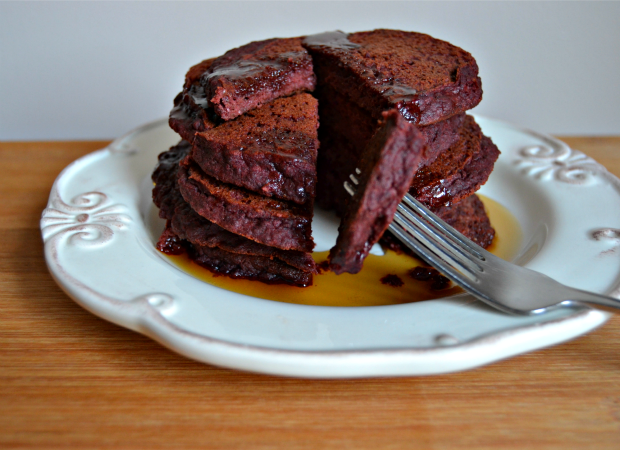 These are Red Velvet Pancakes made with raw cacao, maca, chia seeds, hemp seeds, and coconut milk. Don’t be scared off by the addition of chia seeds in place of an egg. These mighty little seeds are full of fibre, calcium, protein, and vitamins and minerals. They will provide your body with a healthy dose of omega-3’s as well. If you don’t have any, you can easily use an egg instead although you might even find that you prefer the vegan version even more! Mix the ground chia seeds with the water and set aside to gel. Pour the mixture into a large bowl and whisk in the chia seed gel. Add the rest of the ingredients and whisk until everything is combined. Melt a little more coconut oil into a frying pan dropping spoonfuls of the pancake batter, a couple of tablespoons at a time. Cook on the first side until they begin to bubble and the edges firm up then flip them over for another minute or two. Serve with a knob of coconut oil, maple syrup, fresh fruit, or dairy-free ice cream! These cookies are a healthier version of a traditional cookie favourite. Previously made before, they’re so simple and delicious to make I knew I wanted to make some this year for Christmas. A simple addition of spirulina added to the macadamia white chocolate icing with a sprinkle of bee pollen and you have all you need to make these festive Christmas treats! First, soak the macadamia nuts for a minimum of 4 hours, or overnight. Make the cookie dough: Add the coconut oil, eggs, and vanilla to a large bowl and mix together with a hand mixer until fluffy. Add the coconut sugar and maple syrup and mix again. Finally, add the ground almonds, flour, baking powder and salt and mix until combined. Cut into desired shapes then place them onto a parchment lined baking tray or non-stick pan. Pop into the oven for 5-7 minutes (they bake quickly!) until slightly golden on the edges. Allow the cookies to cool. Make the icing: In a double boiler, melt the cacao butter. When it’s completely melted, remove from the heat and add the honey. Allow this to melt into the cacao butter until they are combined. Rinse and drain the macadamia nuts then add them to a high-speed blender. Split the vanilla pod in half with a knife and scrape the seeds out to add in along with the cacao butter, honey, salt, and 1 tbsp of almond milk. When the icing is smooth, add 1 tsp of arrowroot powder until just combined. 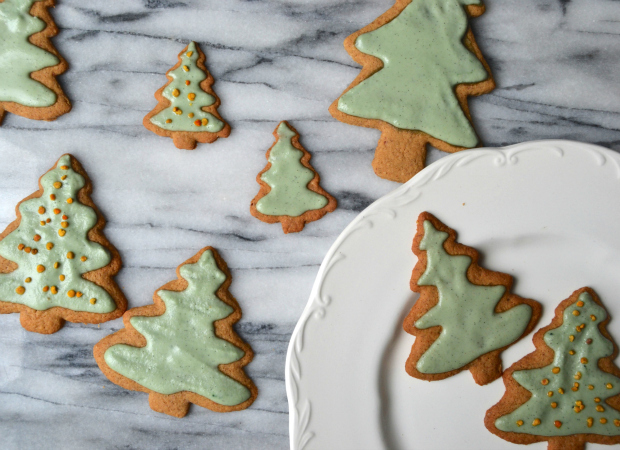 Add the spirulina until you reach your desired hue then decorate each cookie by smoothing icing onto each one, sprinkling with bee pollen, or anything else you might like. These keep best in the fridge until ready to eat. 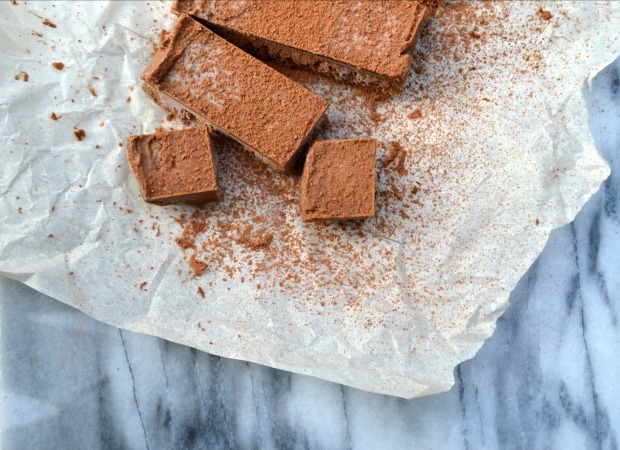 If you’ve never made your own chocolate, from scratch, you are in for a treat. And seeing as Halloween is right around the corner, I thought it fitting to make it into pumpkin molds. I shared making raw chocolate a while ago on Instagram by making little cups full of the stuff, topped with chopped nuts, chia seeds, and hemp seeds. They are such a delicious treat and once you have a taste of making your own, you’ll find it hard to go back to anything else. 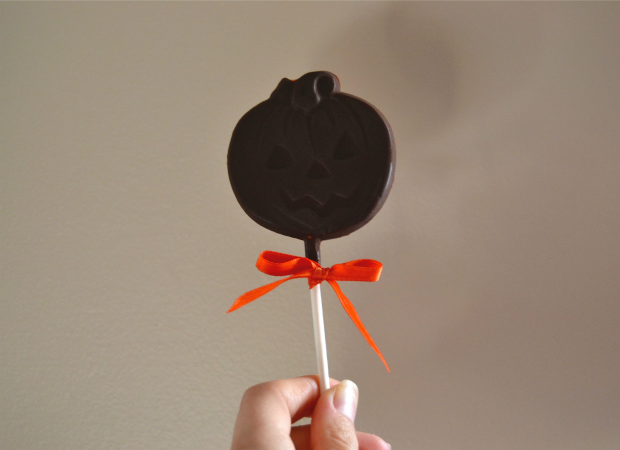 I used a lollipop pumpkin mold and this recipe made four of them. You can just as easily make this recipe and pop the chocolate into cupcake cases or even spread it out across some parchment paper. Cacao butter is the main component in making chocolate. I’ve seen a lot of recipes that substitute coconut oil, but I find this is an essential ingredient in creating the right texture and taste. The smell alone reminds me of what chocolate is all about. I found it easiest to grate the cacao butter, but I have also just eyeballed the amount and let it melt that way. I would recommend measuring everything out the first time round just to be sure. I grated out 2/3 cup of cacao butter, which equals just about 1/3 cup when melted. You can also add vanilla bean (although it might create more of a grainy texture) but I quite like it. Feel free to also mix in things such as bee pollen; nature’s sprinkles as I like to call them, are the perfect colours for Halloween with their purple and yellowy-orange granules. In a double boiler over just simmering water, melt the cacao butter. Whisk until it is completely melted. Add the maple syrup and cacao powder (and vanilla if using) and whisk until everything is smooth. Remove from the heat allowing to slightly cool for a minute or two. Pour into desired mold and mix any additions through. Place into a fridge to set for a few hours before gently removing from the molds. These are best kept outside of the fridge once they’ve set as the cacao butter begins to rise to the surface of the chocolate resulting in a white appearance. If you plan on storing them for longer I’d place them in a sealed container, although they never last that long! Snacks– I’ve never been a fan of plane food (show me someone who is!) even more so now so I usually make sure to stock up on a bunch of snacks I can tuck away in my carry-on. This time I’m taking coconut chips, paleo granola bars, popcorn, homemade granola, and my favourite, chocolate! I also really enjoy grabbing my own meal at the airport from the best place I can find and taking that on board. Flying out of Gatwick, I usually head to Pret A Manger and grab one of their superfood salads and a green juice. Water– I like to buy a big litre bottle of water once I’ve cleared security so that I can stay properly hydrated before flying. Airplanes play so much havoc on our skin and we dehydrate quite quickly so it’s always good to have water on hand at all times. Lip Balm– I usually have more than one kicking about in my handbag and the same goes when on airplanes. I love my Nova Scotia Fisherman lip balm and I also love to take a little of May Lindstrom’s Blue Cocoon on board which not only smells heavenly but also doubles as a moisturizer and eye cream. Rose Water– I really love rose water at the moment. It’s been really great for calming inflammation on my skin and keeping it hydrated before applying a moisturizer. Plus it smells really lovely and the size is acceptable to bring onto the plane. Anti-Bacterial Spray/Gel– Hundreds of people, several hours, all cramped in one small space does not make for the most hygienic place! It’s good to carry something extra and I love this Dukha To Sukha spray (actually a yoga mat spray) because it’s multi-purpose and makes a great hand sanitizer. Oregano Oil– Without fail, around this time of the year I tend to come down with a cold and I’ve been fighting this off by taking oregano oil. It doesn’t taste that great but it really is one of the best things I have found to take for the immune system. Any sign of sniffles or sore throats disappears when I take this and I’ve been having it everyday in the lead up to flying. Essential Oils– I don’t wear perfume but I do love the scent of many essential oils. I find them a lot subtler and they’re really lovely to have either to relax before a flight or freshen up with just as you’re landing. I have a blend for stress and anxiety that I love from this little apothecary shop I found in the New Forest. Eye Mask– I can’t always sleep on planes but I make sure to pack one of these anyway just in case! This one is from Saje Wellness and smells of lavender and chamomile. Big Comfy Socks– I usually find myself getting super cold on airplanes so I always pack a big warm pair for the journey. Notebook– I also take along a notebook to write down anything and everything that comes to mind. Being disconnected from technology and having so much time on your hands is a really good reason to keep this on hand. Headphones– The in-flight ones just aren’t the same as pulling out my own pair that I know are guaranteed to work to watch movies and listen to my music. Gum– This tends to already be in my handbag so I just pack some more for a longer journey; I love Pur gum. Scarf– I love scarves and always have a hard time choosing which ones to take with me when I go anywhere! I always pack a bigger, warmer, cozy one like my cashmere one which doubles as a blanket. Sunglasses– Always pairs well with jet lag and even works to hold up messy hair before you get the chance to grab a shower. Tili Bag– I loved these bags from the first time I saw them. They come sized and ready to go through security and come in really cute patterns to carry all of your liquids. You can find them here. Travel Documents– Of course you can’t go anywhere without these and they are the most important. I have a travel pouch that I keep my passport and tickets in so they’re easy to access. I know all of this seems like a lot but it really isn’t when it’s all packed and in your bag. 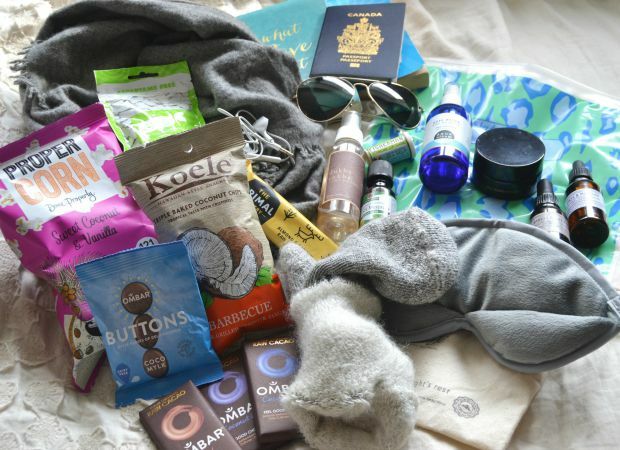 Traveling between the UK and Canada no longer feels like a huge trek to me and I find having these items tides me over and keeps me happy on my journey until I arrive at my destination. 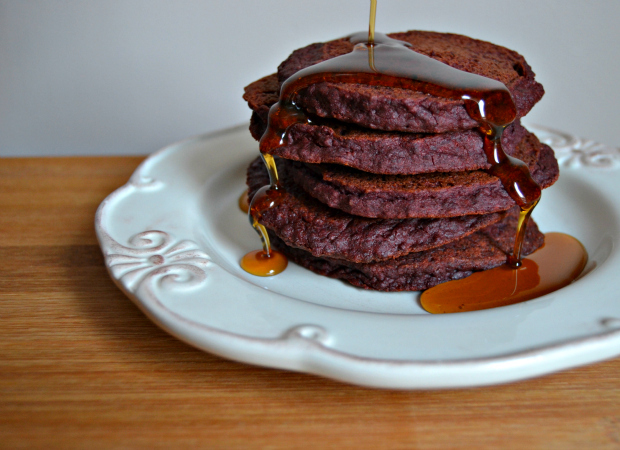 I’m not saying you should be eating brownies for breakfast, but you could probably get away with it with these ones. That’s because they contain the combination of protein, fiber, and healthy fats with the addition of black beans and avocado. Not only do these ingredients create a great texture, they’re providing you with a host of nutrients. I’ve found that the key to making good, fudgy, chocolaty brownies is in the baking time. There’s a fine line between baking them for too long and too short of a time; that’s why I’ve left a varied baking time as all ovens differ. I find they’re always best baked a little underdone. You want to check the brownies at 10 minutes, then every few minutes until they’re ready. You’ll know when you can smell them, the edges begin to turn brown, and a toothpick in the center comes out almost clean. I’ve used the best cocoa powder I can find in the brownies but for the chocolate drizzle, I’ve used raw cacao powder. 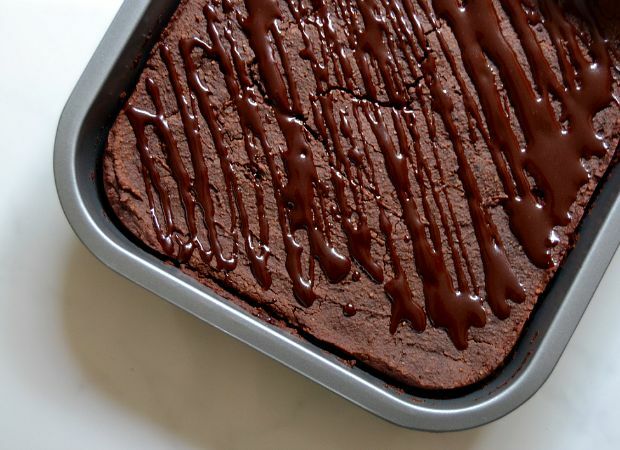 It takes two minutes to make and finishes the brownies off nicely. As tempting as it is to enjoy these straight out of the oven, they taste really amazing once they’ve been left to cool and are even better the next day. Pop them in the fridge for an even fudgier treat. Pre-heat your oven to 350°F and grease an 8 inch baking dish with coconut oil. Drain and rinse your black beans and add to a food processor. Drain your dates, and add them, blending until they become incorporated with the beans. Add the rest of the ingredients, blending along the way until everything is combined. Scrape down the side of the bowl if needed to ensure everything is mixed well. Pour the mixture into your baking dish, smoothing out the top, then pop in the oven for 10-20 minutes. While the brownies are baking, make the chocolate drizzle by whisking together all the ingredients in a small bowl. Remove the brownies from the oven allowing them to cool completely before adding the chocolate drizzle and if you like, some raw cacao nibs. Cut into squares and enjoy.